This is not unusual on a new silver or gold ring. Please read below. Don’t panic, this “green or black finger effect” is a reaction to the copper alloy in the sterling silver especially if you have high body acidity. It happens to about 2-3% of people and percentage is increasing due to increased percentages of chemicals in our environment and food we eat. Sometimes these reactions are occasional and happen when someone eats something with high acidity like tomatoes, if someone is taking certain medications, or due to excitement. Soaking the ring for a day or two in a 50/50 mixture of household ammonia and water will take care of the problem. Applying a layer of Jeweler’s Skin Guard (which we can provide for you) on the inside of the ring will prevent perspiration & body sweat from reaching the metal and reacting to it. Clear nail polish will also work. Keep your skin dry when wearing jewelry. Remove ring before showering, sleeping, exercising, strenuous activities, or using cleaning products. Keep your jewelry clean. If the piece begins to tarnish, clean it immediately. 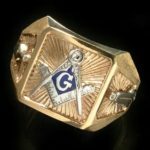 This entry was posted on Tuesday, March 28th, 2017 at 12:59 pm	and is filed under Freemasonry. You can follow any responses to this entry through the RSS 2.0 feed. Both comments and pings are currently closed.